Kid’s bedrooms are spaces to play in. Creative, quirky and holding all their favourite things, they are a soft place to dream of future careers, hobbies – or maybe just the day ahead. Have a little girl that’s always away with the fairies? 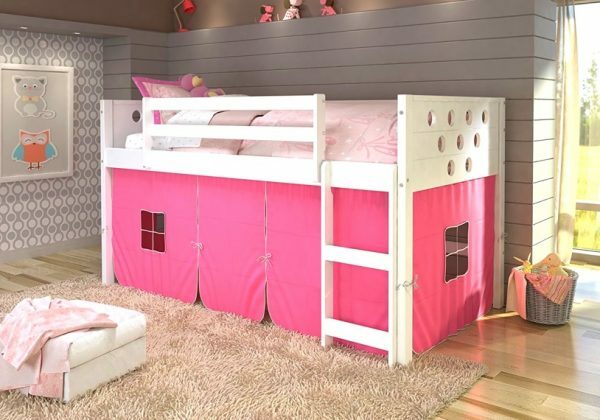 Decorate her bed in pink, with plenty of storage for fairy dust. Parent to a budding race car driver? Tuck them into a car to the land of nod. Want your kids’ bed to last past their latest fantasy? Design their sleeping space for an industrial or minimalist interior. Take a peek at our top 40 picks for playful and storage-friendly kids’ beds. 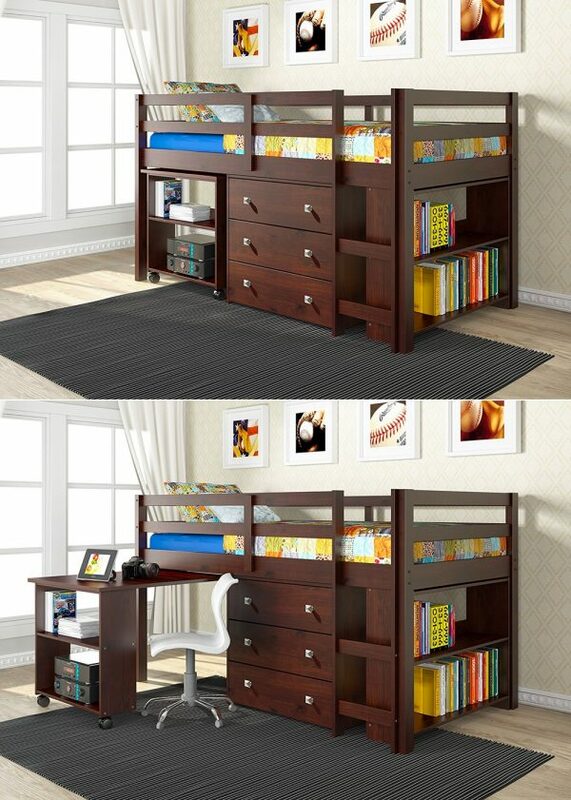 Kids’ Low Study Walnut Loft Bed: Your child needs more than just a place to sleep. They need a place to store books, a place to store clothes and a place to study, all provided for in this handy roll-out walnut solution. 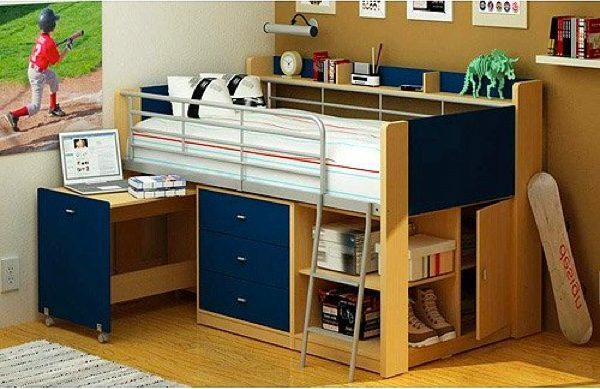 Space-Saving Bed For Kids With Storage And Workspace: Kids not old enough for a desk? Make the desk a bedside table, the drawers smaller, and the frame a different colour with this one-piece in natural and navy-painted wood. 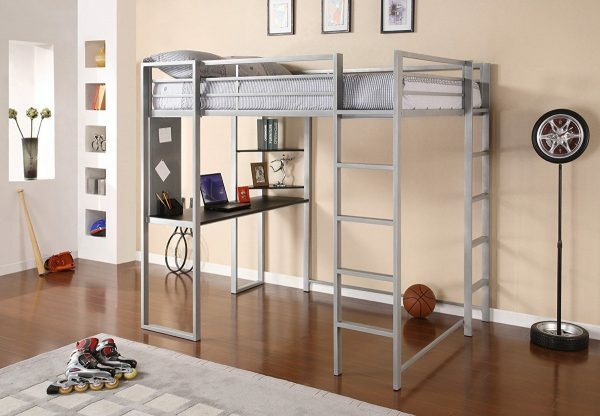 Kids’ Metal Trundle Bed: Need some extra space for your child’s friends? This metal trundle bed rolls out an extra mattress when the need arises. 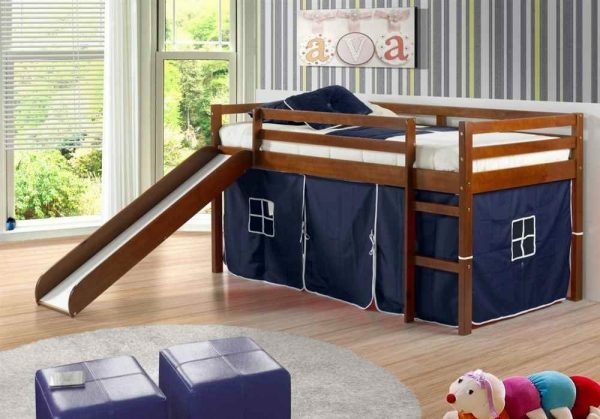 Boys’ Tent Bed With Slide: Bedtime couldn’t get any more fun. This polished pine loft bed lets your young one play house underneath, climb up for a rest, and slide down to Mummy and Daddy. Girls’ Tent Bed: Buying for a girl? Make playtime prettier in this pink and white construction. House-Shaped Kids’ Bed: Pine wood with steel reinforcements make a little house for your kids to sleep in. Coated in non-toxic paint, it holds a twin bed. 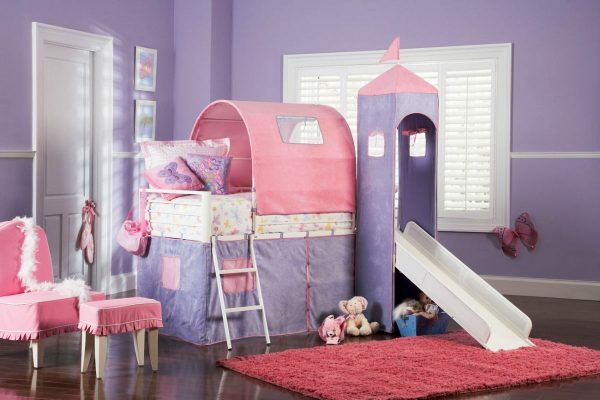 Princess Castle Bed With Slide: Make your little princess’ dreams come true. Featuring a Rapunzel-esque tower, slide, play tent and sleeping area, its steel and polyester fabric creates an in-house fairytale. 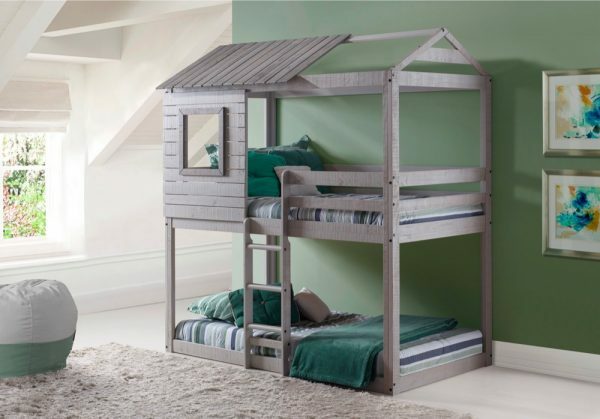 Grey Rustic-Style Low Loft Bed With Tent For Kids: After a loft bed in more muted colouring? This grey-wooden bunk offers fold-up flaps for its play tent below. 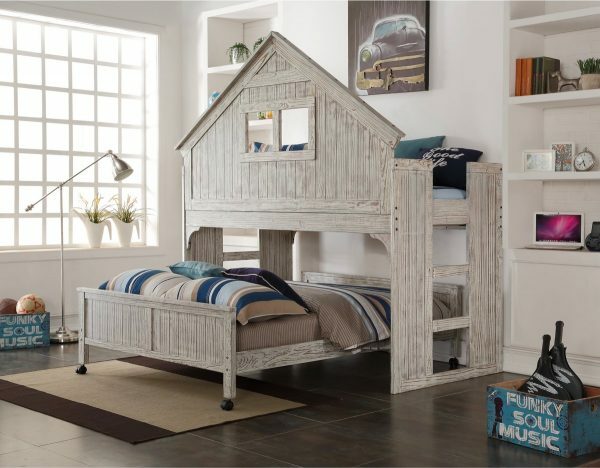 Rustic Trundle Bed For Kids: Your bach or beach house has the perfect accessory in this rustic trundle bed. Featuring wooden planks at alternating levels, a roller bed beneath sleeps an extra head. Tufted Bed With Trundle: Don’t have room for a another bed? Roll out the linen-like sleeper on this beige, quilted couch when small visitors arrive. 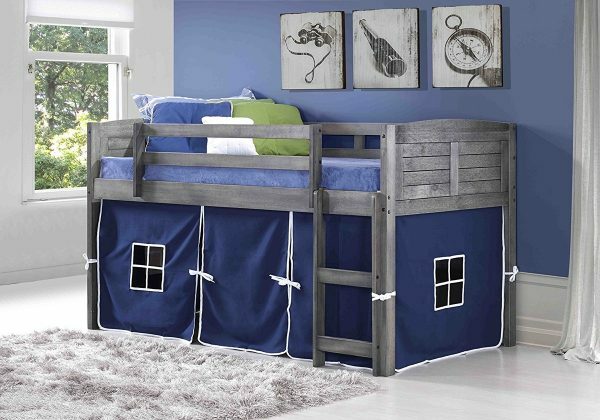 Loft Bed With Storage For Kids: Kids come with more than just cuddles. 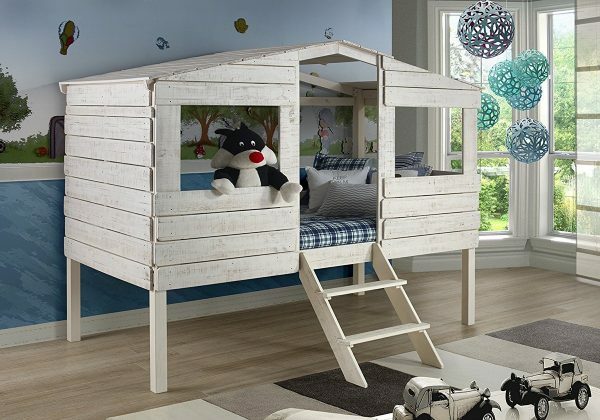 Store their many toys, nappies, clothes and accessories in this white birch, maple and aspen bedroom system. 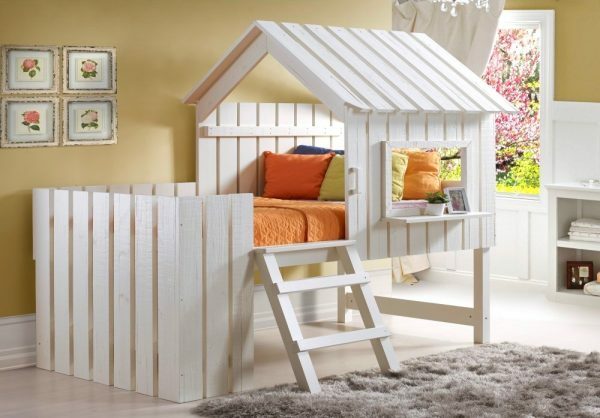 Tree House-Style Kids’ Bed: Don’t have a treehouse? 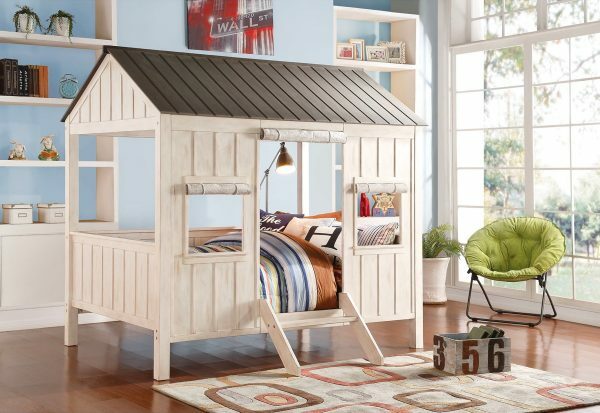 Build your child one inside, with this solid pinewood loft bed with rustic finish. House-Shaped Bed For Kids: A slatted bed frame holds your little one, in this mini house within your home. Featuring a realistic exterior, roll-down windows and a ladder, it creates a sleeping space all their own. Industrial-Style Pipe Bed, Black: Have an industrial home interior you’re keen to match? This black metal pipe bed has a place in your kid’s bedroom. Pipe Bed White: For a whiter and brighter interior, this metal pipe bed does the trick. Pick a colourful bedspread to appease your little one. Classic Girls’ Bed: Maple, birch and aspen combine to form this classic white girls’ bed. A rounded headboard and scalloped edge add craft to functionality. Contemporary Tufted Beds For Kids: Want your kids’ beds to last through the ages? This quilted, button-tufted option is sure to act a classic. 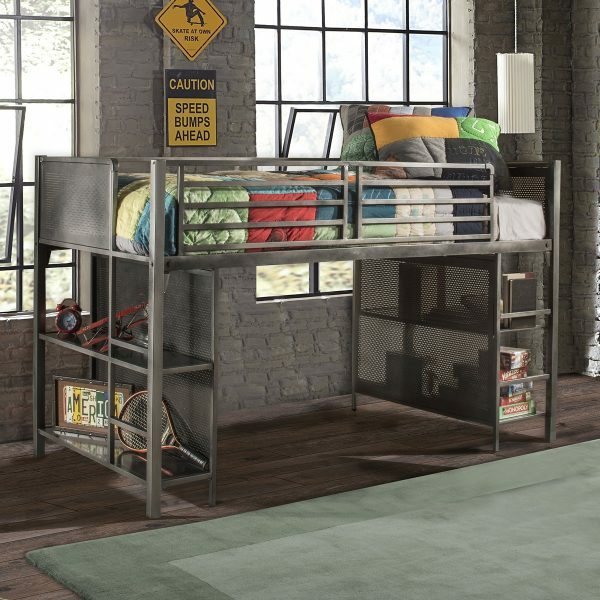 Industrial-Style Loft Bed With Storage: Have a little boy who loves the rough-and-tumble lifestyle? Sleep his frame upon this brushed steel contraption, complete with mesh steel cavities to hold all his toys. 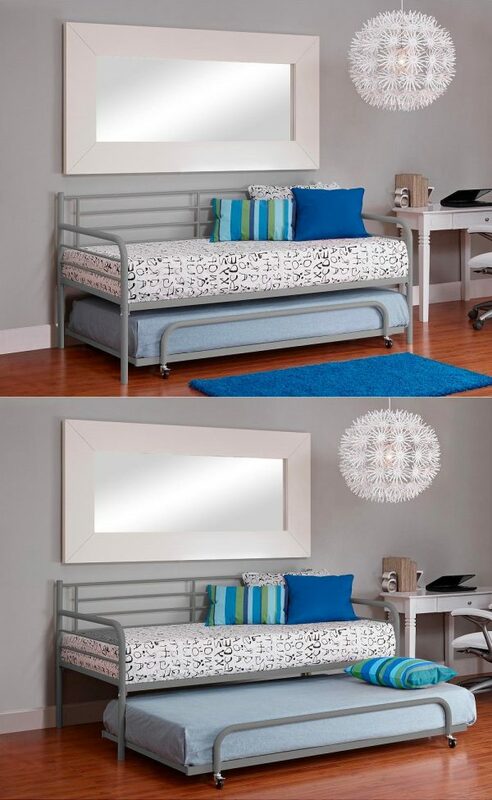 White Metal Frame Low Loft Bed: Need a basic design with all the handy fixtures? 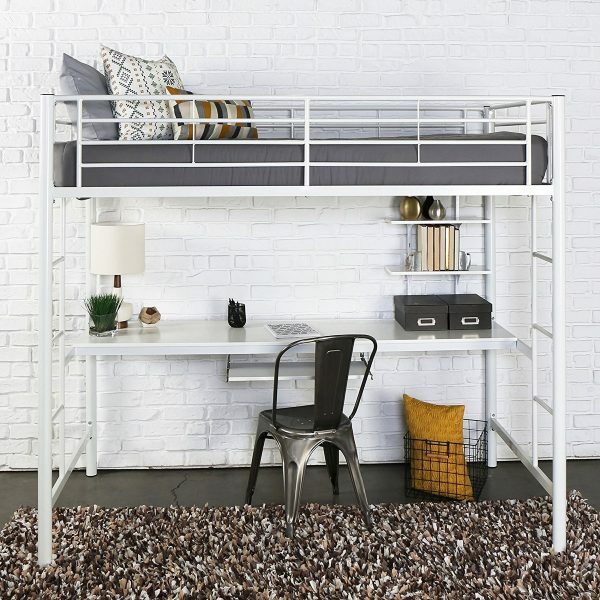 This white metal bunk offers storage in a ladder, a swing-out desk for homework time. Mint Colored Kids’ Loft Bed With Workstation: Don’t have room to swing out a table? Place it under your child’s sleeping space, in this mint-coloured bed frame. Loft Bed With Full-Length Workspace Underneath: As your child grows, their head space increases. This high, white-painted sleep and work space offers room to grow. Full-Size Loft Bed With Workspace: Horizontal workspaces can miss out on the view outside. Angle your child’s desk towards the window, as they climb a little higher to the bunk bed above. 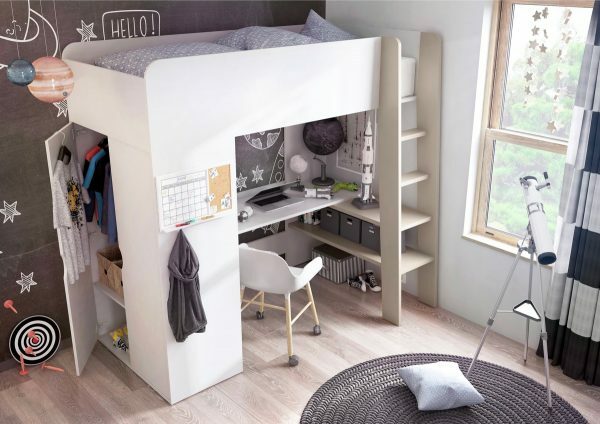 Modern Kids’ Loft Bed With Workspace And Storage: Want a bed with a bit more presence? This sturdy white creation is decked out with a desk, wardrobe, ladder, bed and mattress. Platform With Lots Of Storage: Are your kids scared of heights? This heavy-set solution has all the benefits of a bunk bed, without the fear of falling out. Laminated white particle board won’t easily break, bow, scratch or chip. Storage shelves on the side – and under the mattress – leave plenty of room for necessities. 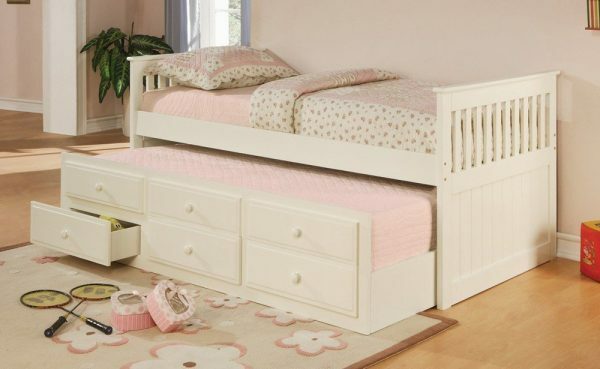 Trundle Bed With Storage: Buy your child a bed that reminds you of your childhood. This cream-painted trundle bed has all the classic features – and six drawers underneath. 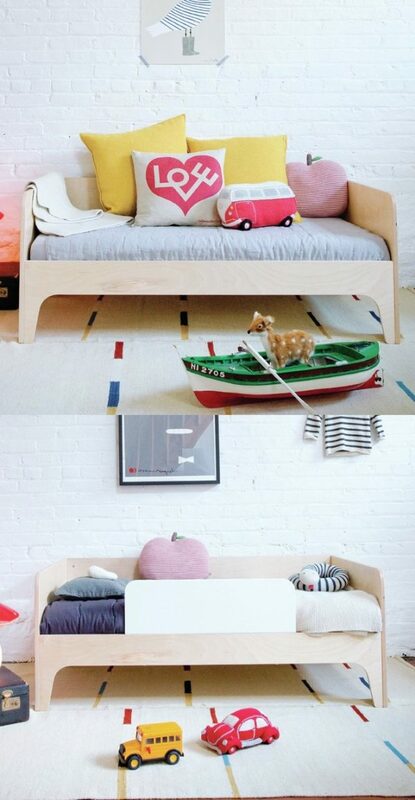 Modern Minimalist Kids’ Bed: Let your children’s bed stand the test of time. This wooden-based minimalist design can weather changes in your interior and the latest fashions. Kids’ Bed With Headboard Shelf: Have a little one who loves an easy reach? Let their arms stretch up to drinks, books and soft toys, in this bed with a nifty headboard shelf. Perch Convertible Toddler Bed: Grandparents rejoice in this handy toddler bed option. Sustainably produced from Baltic birch plywood, this seat-come-toddler bed pairs design with functionality. Wooden Bunk Bed: Make your kids’ bunk beds sturdy. 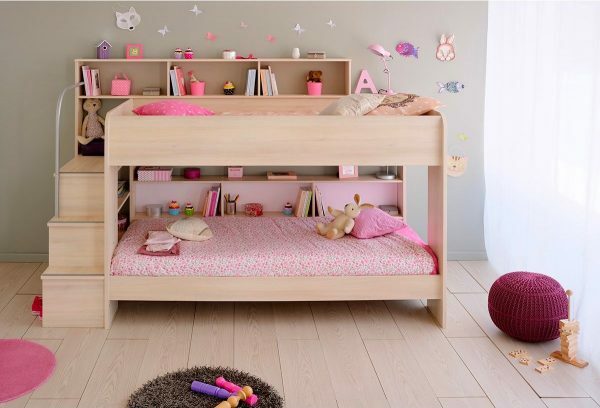 This acacia wood bunk bed offers built in stairs, a metal handrail and deeper beds to keep their sleeping selves in. 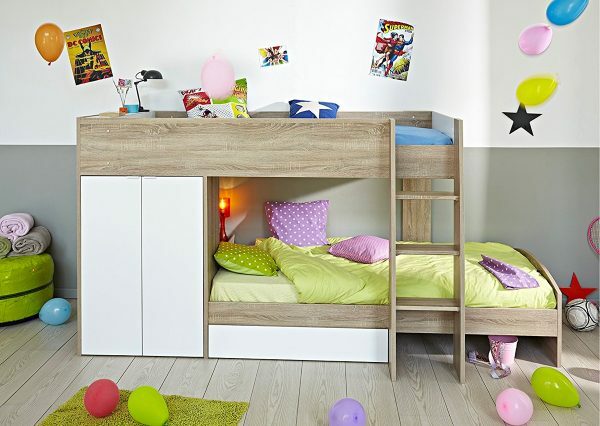 Parisot Bunk Bed: Give your children more sleeping space. The twin bunks in this superhero home décor bedroom offer French-made storage and sweet dreams. 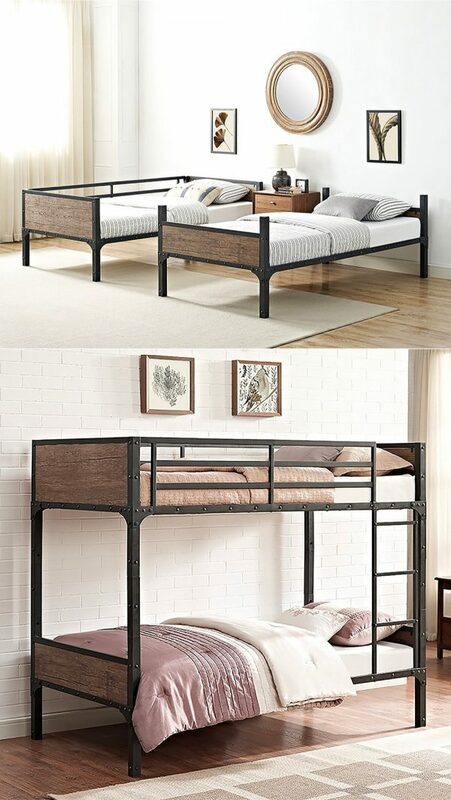 Industrial-Style Convertible Bunk Beds: Sleep your kids together when they’re little, and apart when they’re older. This MDF wood and stainless steel bunk can form one unit or two twin beds. 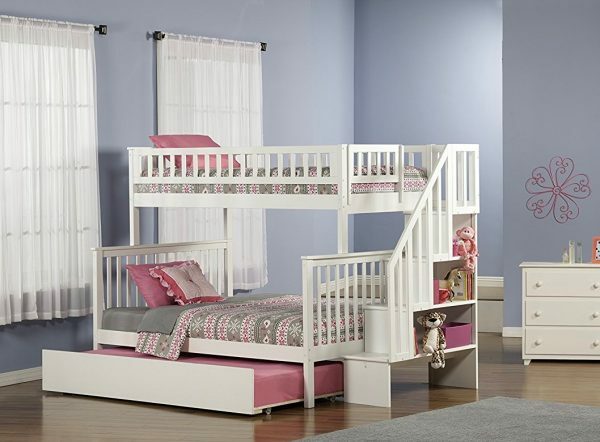 Kids’ Staircase Bunk Bed with Trundle: Nobody likes looking into a top bunk’s bottom. 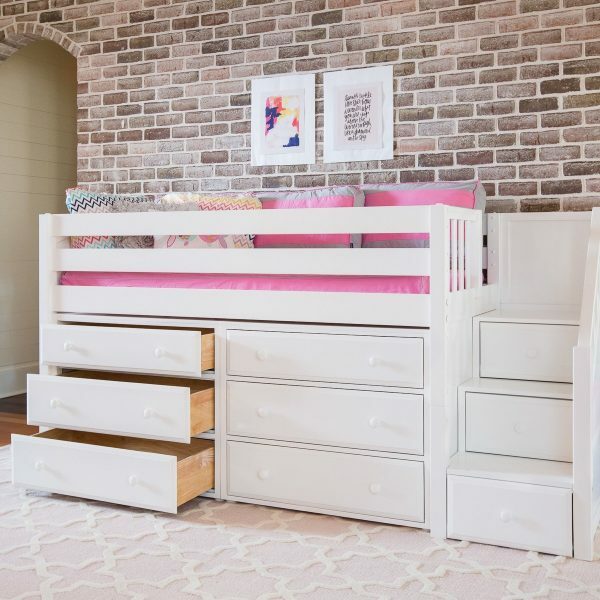 Give your kids room to breathe, with these three bunk beds with staircase storage. House-Shaped Double Bunk Beds For Kids: Complete with camouflage pockets, this two storey house-come-bunk bed brings an element of play to sleeping time. Home-Shaped Double Bunk Beds: Add a sense of adventure to bedtime. 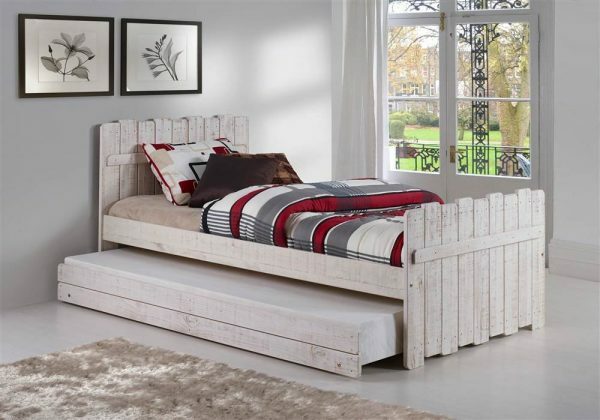 This driftwood-finish pine wood bed offers a single bed above, a double below. 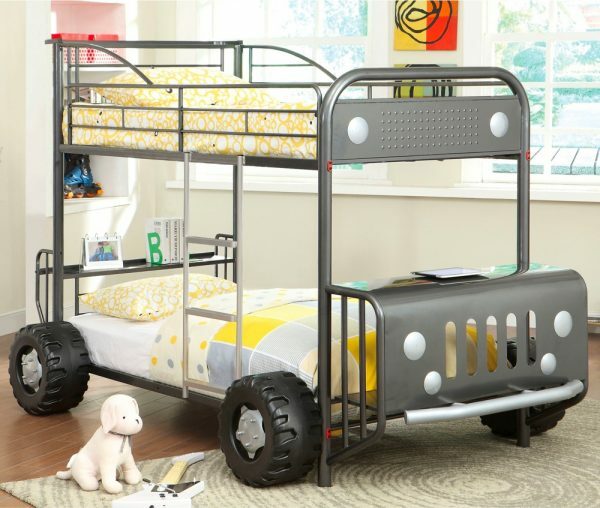 Metal Jeep Bunk Bed For Kids: Industrial décors can’t go past this creative jeep bunk bed. Two levels clad in steel and mounted on tyres ensure your kids’ dreams will go places. 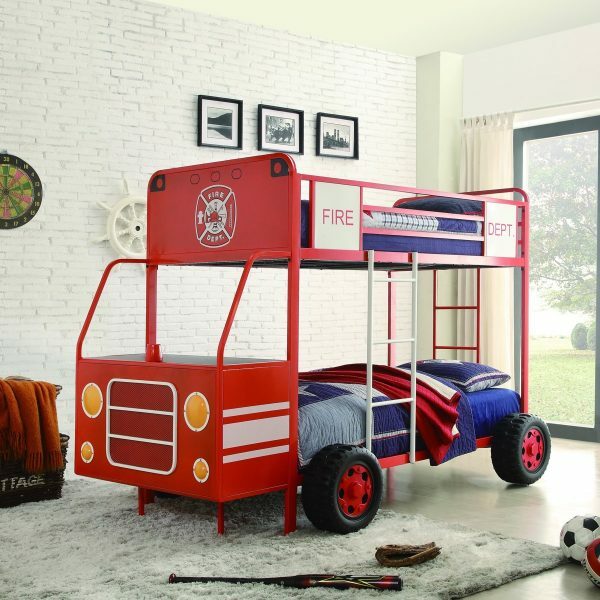 Fire Truck Bunk Bed For Kids: Becoming a fireman part of your child’s dreams? Featuring a front-of-truck driving space, wheels, two industrial ladders and fire station decals, this red bed is the next best thing. 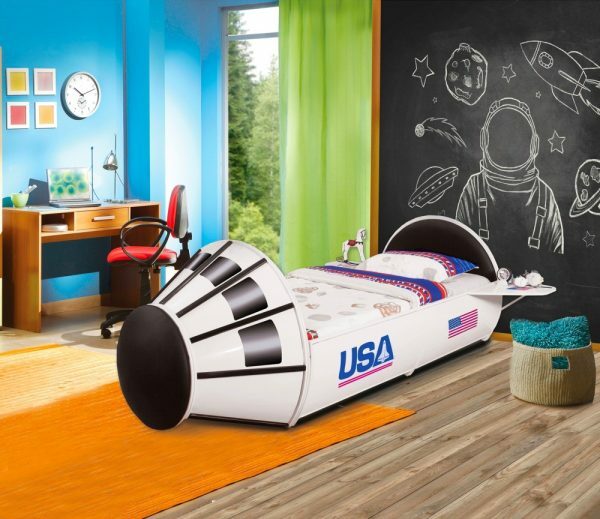 Space Shuttle Bed: Send your little one to space, with this metal and faux-leather, space-themed home décor addition. Race Car Bed For Kids & Toddlers: Who can turn down a Corvette? This red-hot twin bed displays silver rims, tap-on headlights and a built-in race track to hone your child’s skills. 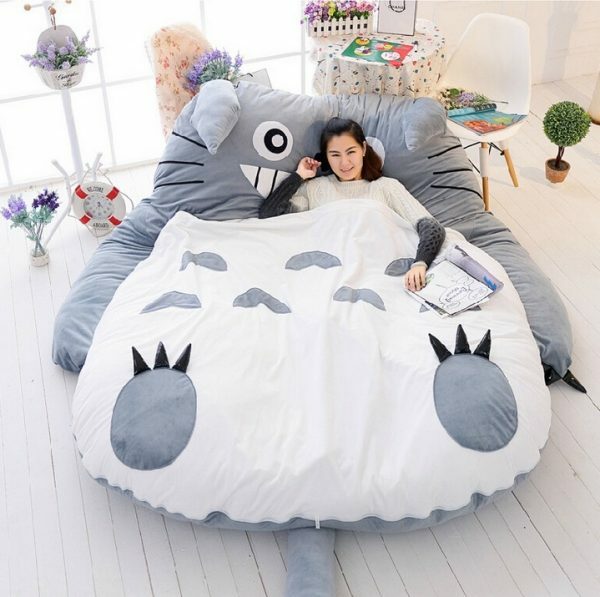 Kids’ Sofa Bed: Inspired by Hayao Miyazaki’s famous Japanese anime, this giant sleeping bag doubles as a sofa bed for unexpected visitors. Privacy Pop Tent: Sometimes kids find it hard to sleep. Insulate their privacy with this zip-up tent fitting twin bed frames. With mesh sides for ventilation and six colours to choose from, this tent provides a haven on your existing frame and mattress.